Plays a sound when your Mac sleeps or wakes up. Is there a better alternative to Lidpop? Is Lidpop really the best app in System category? Will Lidpop work good on macOS 10.13.4? 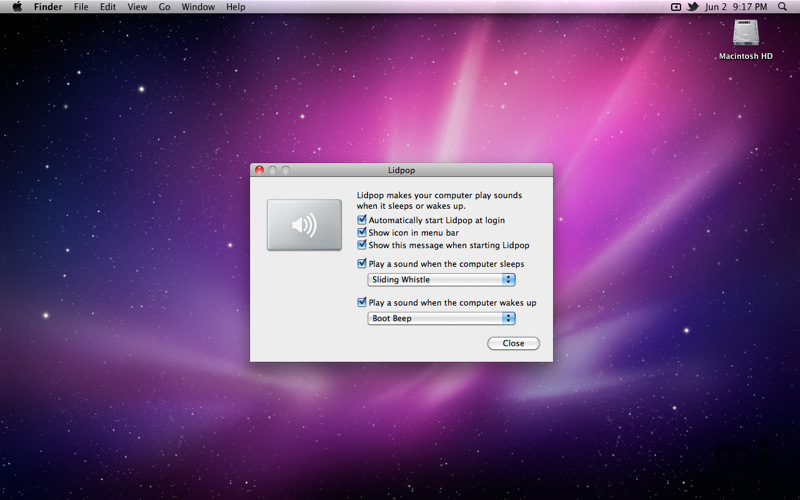 Lidpop makes your Mac play a sound when it sleeps or wakes up. Close the lid with a resounding clank or a happy slide whistle. Open it back up with a laugh or a whimsical chime -- it's up to you. Lidpop brings a dash of personality to your computer. Compatibility fix for Mac OS X Lion. Lidpop needs a rating. Be the first to rate this app and get the discussion started!